Wendell Holland won the $1 million grand prize on Survivor: Ghost Island, making for the "the most dramatic finish in Survivor history" according to host Jeff Probst. Wendell, a 33-year-old furniture company owner from Philadelphia, PA, won by a single vote, defeating the runner-up, Domenick Abbate. 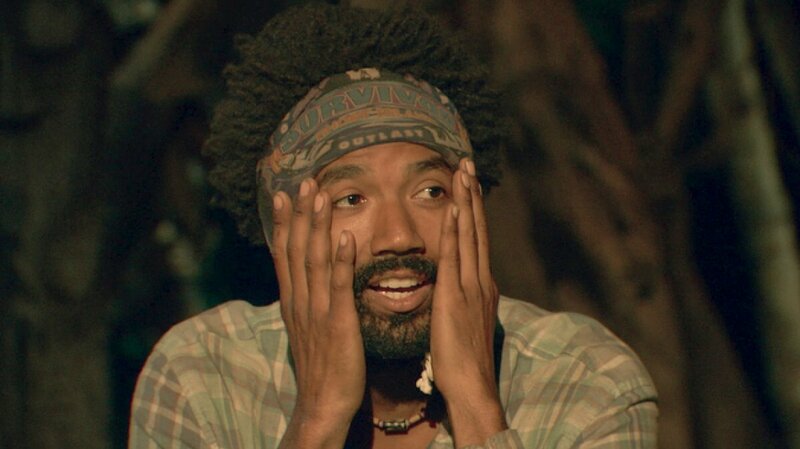 But the one vote that put Wendell over the edge was actually a tie-breaker vote cast by the season's third-place finisher, Laurel Johnson, who received zero votes to win. The initial tie jury vote was the first time Survivor has seen this happen in 36 seasons. In addition to Laurel, Wendell received jury votes from Chelsea Townsend, Sebastian Noel, Donathan Hurley, Kellyn Bechtold, and Angela Perkins. As for Domenick, he earned votes from Michael Yerger, Chris Noble, Libby Vincek, Jenna Bowman, and Desiree Afuye. During a recent exclusive interview with Reality TV World, Wendell talked about his Survivor: Ghost Island victory and experience overall. Below is the concluding portion of what he had to say. Reality TV World: If you had won that final Individual Immunity Challenge, whom would you have picked to make fire? Angela and Dom? Wendell Holland: It would have been Angela and Dom, because I told Laurel from the get-go I wanted to sit with her at Final 3. And I wouldn't give Dom a free pass, because he wouldn't give me a free pass to the end. And as much as I'd want to say, "Hey, I put myself against Dom in fire making," no, no, no. As much of a hero you want to be, that is a tremendously risky move, and (laughs) losing that fire-making challenge against Dom would put me on Ghost Island too! So I don't want one of my mistakes coming back on the next season of Ghost Island. So I would've taken my sister Laurel to end and just let Dom and Angela fight it out. Reality TV World: Do you think you could've beaten Domenick though, had you two gone head to head? Wendell Holland: Yeah! I think I could beat Dom at fire making. Reality TV World: Did you have any awareness Dom was considering facing off against you in fire? And how would you have reacted had Dom actually gone through with the showdown? Wendell Holland: Playing against Dom, you know that anything's possible. His head is always working. He's always thinking of a different way to do something, and he played Survivor on a very high level. I consider him taking off his final immunity necklace and putting it around Laurel and having her go to the end and him stepping up and playing and competing against me, yes I knew it was in the realm of possibility. Did I think it would happen? Absolutely not, because he knew if he did that and went home, his wife Kristin would have killed him, first of all, but you just can't risk it. He came too far to risk that. So yeah, as much as he said he would've done it, nah, he wouldn't have done that. Reality TV World: How much did you practice for the fire-making challenge before it went down? Because we saw Angela practicing with Dom quite a bit, but not you. Wendell Holland: Well, before I went on the show, I practiced for months every day in my parents' backyard. Even months before the show, I posted an Instagram video of me making fire. So I knew exactly what I was doing, and on the show, I made fire a bunch of times. Then, when they took us to Ghost Island, I made fire. So I was on-point with making fire. I even taught Laurel how to make fire out there a few days before that challenge because we didn't know who was going to the end. That wasn't shown on TV. But I was on-point with making fire. I was very, very confident in my abilities. Reality TV World: I wanted to clear up something: The fake idol Domenick played at the Tribal Council when Sebastian went home, did you know that was fake at the time? Wendell Holland: I had an idea it was fake. What happened? This wasn't on-camera, but Dom showed me that idol, and he showed me the parchment that was three quarters of some immunity instructions. So, I was under the distinct impression it was a fake idol, and I even -- this wasn't shown -- but I whispered to Sebastian when Dom was doing all that, "It's not a real idol," or something like that to him. So yeah, I had a very strong idea. I believed it was a fake idol, and I believed that's why someone would play it early like that. Reality TV World: Wow, I'm shocked Sebastian didn't follow through with his original plan to vote for Domenick given you actually warned him the idol was probably fake. Wendell Holland: Yeahhh, but I think Sebastian was really caught off-guard when he learned that we knew the whole plan. He was shocked, and I don't think he was ready to maneuver or think of a different way. Reality TV World: You seemed pretty superstitious while you were out there, like you insisted on making fire at the purple station, for example. Do you think that last-minute switch saved your game, or do you not take Survivor curses and superstitions that seriously? Wendell Holland: I wasn't willing to take the chance. (Laughs) I mean, whether the orange color was truly cursed out there -- I just didn't want to even risk it. So, the purple color was doing right by me all season, so I just didn't want to [stray]. I mean, there might be some real curses out there, and I'm not chancing that. So if Angela is willing to give me the purple seat, I'll take it. Reality TV World: You won back-to-back Immunity Challenges in last night's finale, and you came so close to winning the final challenge as well. Were you holding out in previous challenges as to not become an even bigger target than you already were, or do you just perform excellently under pressure? Wendell Holland: I do perform well under pressure, but that even showed in earlier challenges when we had the big tribe challenges. I had to make baskets at the end or throw things around; I do perform well under pressure. And earlier in the season, I won some challenges for our whole team. So, people knew I was able and that I could potentially be a big challenge threat. And then when it got to Individual Immunities, there were certain types of games that anyone could win. But I knew if there was a game that involved me jumping, swimming, running and doing all of this physical stuff and ending with some kind of puzzle, I knew that that was my wheelhouse, especially if it's a visual puzzle. So, the Final 2, that's what it was. It was a giant maze and I knew I had more stamina than anyone out there, and I just kept running and running and running until I found these things, and I felt confident in my visual puzzle abilities. So stuff like that giant maze was built for me. And then that last one, I had to swim, run, jump over some things, run under some things, and then I had to make a pyramid puzzle. That's another thing: I got to the puzzle before everyone. I was able to beat them to the puzzle, and then puzzles are equalizers on Survivor because you could have this big, huge challenge that only takes five minutes, but the puzzle might take 20 minutes. And that's what happened with that puzzle. Reality TV World: Do you have any big plans for your $1 million prize money? Wendell Holland: I have a whole lot of law school debt that I need to pay off, so that's where it's going to go. And then hopefully I can invest the rest of the money into something smart. To read the first half of Wendell's interview, click here. And to check out Reality TV World's exclusive Survivor: Ghost Island interviews with the remaining Final 6 castaways, click here.